Heydari, J., Norouzinasab, Y. (2016). Coordination of Pricing, Ordering, and Lead time Decisions in a Manufacturing Supply Chain. 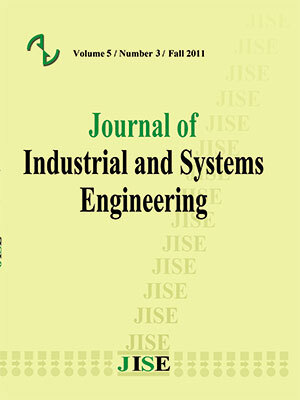 Journal of Industrial and Systems Engineering, 9(special issue on supply chain), 1-16. Jafar Heydari; Yousef Norouzinasab. "Coordination of Pricing, Ordering, and Lead time Decisions in a Manufacturing Supply Chain". Journal of Industrial and Systems Engineering, 9, special issue on supply chain, 2016, 1-16. Heydari, J., Norouzinasab, Y. (2016). 'Coordination of Pricing, Ordering, and Lead time Decisions in a Manufacturing Supply Chain', Journal of Industrial and Systems Engineering, 9(special issue on supply chain), pp. 1-16. Heydari, J., Norouzinasab, Y. Coordination of Pricing, Ordering, and Lead time Decisions in a Manufacturing Supply Chain. Journal of Industrial and Systems Engineering, 2016; 9(special issue on supply chain): 1-16. In this paper, an incentive policy is proposed to coordinate ordering, lead time, and pricing strategies in a two-echelon manufacturing supply chain (SC) consisting of one manufacturer and one retailer. The system is faced with a stochastic demand which depends on both price and lead time. The manufacturer decides on production size and manufacturing acceleration rate while the retailer determines the retail price and order size. A game-theory approach is proposed to analyze both members’ decision making process. An integrated decision making process where both members cooperate as a single entity aiming to maximize system-wide profit is formulated. Finally a coordination mechanism based on adjusting wholesale price is proposed to convince both members to decide jointly. Numerical experiments demonstrate that whole SC profitability as well as both members profitability is increased by applying the proposed scheme. Results indicate that coordinated decision making decreases both retail price and lead time length while it causes an increase in order size. Anli, O. M., M. C. Caramanis and I. C. Paschalidis (2007). "Tractable supply chain production planning, modeling nonlinear lead time and quality of service constraints." Journal of Manufacturing Systems 26(2): 116-134. Ben-Daya, M. and M. Hariga (2003). "Lead-time reduction in a stochastic inventory system with learning consideration." International Journal of Production Research 41(3): 571-579. Boyacı, T. and G. Gallego (2002). "Coordinating pricing and inventory replenishment policies for one wholesaler and one or more geographically dispersed retailers." International Journal of Production Economics 77(2): 95-111. Chang, H.-C., L.-Y. Ouyang, K.-S. Wu and C.-H. Ho (2006). "Integrated vendor–buyer cooperative inventory models with controllable lead time and ordering cost reduction." European Journal of Operational Research 170(2): 481-495. Chen, J. (2011). "Returns with wholesale-price-discount contract in a newsvendor problem." International Journal of Production Economics 130(1): 104-111. Chen, X. and D. Simchi-Levi (2006). "Coordinating inventory control and pricing strategies: The continuous review model." Operations Research Letters 34(3): 323-332. Chiu, C.-H., T.-M. Choi, H.-T. Yeung and Y. Zhao (2012). "Sales rebate contracts in fashion supply chains." Mathematical Problems in Engineering 2012. Chung, W., S. Talluri and R. Narasimhan (2014). "Quantity Flexibility Contract in the Presence of Discount Incentive." Decision Sciences 45(1): 49-79. Du, R., Banerjee, A., Kim, S.L., (2013). “Coordination of two-echelon supply chains using wholesale price discount and credit option” International Journal of Production Economics, 143(2): 327-334. Emmons, H. and S. M. Gilbert (1998). "Note. The role of returns policies in pricing and inventory decisions for catalogue goods." Management science 44(2): 276-283. Ghotbi, E., W. A. Otieno and A. K. Dhingra (2014). "Determination of Stackelberg–Nash equilibria using a sensitivity based approach." Applied Mathematical Modelling 38(21): 4972-4984. Glock, C. H. (2012). "The joint economic lot size problem: A review." International Journal of Production Economics 135(2): 671-686. Govindan, K., Diabat, A., & Popiuc, M. N. (2012). “Contract analysis: A performance measures and profit evaluation within two-echelon supply chains”. Computers & Industrial Engineering, 63(1), 58-74. Govindan, K., Popiuc, M. N., & Diabat, A. (2013). “Overview of coordination contracts within forward and reverse supply chains”. Journal of Cleaner Production, 47, 319-334. Goyal, S. (1977). "An integrated inventory model for a single manufaturer-single customer problem." The International Journal of Production Research 15(1): 107-111. Heese, H.S., Kemahlıoğlu-Ziya, E., (2016). “Don't ask, don't tell: Sharing revenues with a dishonest retailer” European Journal of Operational Research, 248(2): 580-592. Heydari, J. (2014a). "Coordinating manufaturer׳ s reorder point: A coordination mechanism for supply chains with long manufaturer lead time." Computers & Operations Research 48: 89-101. Heydari, J. (2014b). "Lead time variation control using reliable shipment equipment: An incentive scheme for supply chain coordination." Transportation Research Part E: Logistics and Transportation Review 63: 44-58. Hill, A. V. and I. S. Khosla (1992). "Models for optimal lead time reduction." Production and Operations Management 1(2): 185-197. Hou, J., A. Z. Zeng and L. Zhao (2010). "Coordination with a backup supplier through buy-back contract under supply disruption." Transportation Research Part E: Logistics and Transportation Review 46(6): 881-895. Huang, K.L., Kuo, C.W., Lu, M.L., (2014). “Wholesale price rebate vs. capacity expansion: The optimal strategy for seasonal products in a supply chain” European Journal of Operational Research, 234(1): 77-85. Huang, Y.-S., W.-J. Su and Z.-L. Lin (2011). "A study on lead-time discount coordination for deteriorating products." European Journal of Operational Research 215(2): 358-366. Jha, J. and K. Shanker (2014). "An integrated inventory problem with transportation in a divergent supply chain under service level constraint." Journal of Manufacturing Systems 33(4): 462-475. Johnson, D. J. (2003). "A framework for reducing manufacturing throughput time." Journal of manufacturing systems 22(4): 283-298. Khouja, M. (2006). "A joint optimal pricing, rebate value, and lot sizing model." European Journal of Operational Research 174(2): 706-723. Leng, M. and M. Parlar (2009). "Lead-time reduction in a two-level supply chain: Non-cooperative equilibria vs. coordination with a profit-sharing contract." International Journal of Production Economics 118(2): 521-544. Li, Y., X. Xu, X. Zhao, J. H. Y. Yeung and F. Ye (2012). "Supply chain coordination with controllable lead time and asymmetric information." European Journal of Operational Research 217(1): 108-119. Lian, Z. and A. Deshmukh (2009). "Analysis of supply contracts with quantity flexibility." European Journal of Operational Research 196(2): 526-533. Linh, C. T. and Y. Hong (2009). "Channel coordination through a revenue sharing contract in a two-period newsboy problem." European Journal of Operational Research 198(3): 822-829. Masihabadi, S., Eshghi, K., (2011). “Coordinating a Seller-Buyer Supply Chain with a Proper Allocation of Chain’s Surplus Profit Using a General Side-Payment Contract” Journal of Industrial and Systems Engineering, 5(2): 63-79. Mokhlesian, M., Zogordi, S.H., Nakhai Kamal Abadi, I., Albadvi, A., (2015). “Pricing decisions in a two-echelon decentralized supply chain using bi-level programming approach” Journal of Industrial and Systems Engineering, 8(1): 106-124. Noori- daryan, M., Taleizadeh, A.A. (2016). “Coordinating Pricing and Ordering Decisions in a Multi-Echelon Pharmacological Supply Chain under Different Market Power using Game Theory” Journal of Industrial and Systems Engineering, In Press. Ouyang, L.-Y., C.-H. Ho and C.-H. Su (2009). "An optimization approach for joint pricing and ordering problem in an integrated inventory system with order-size dependent trade credit." Computers & Industrial Engineering 57(3): 920-930. Ouyang, L.-Y., K.-S. Wu and C.-H. Ho (2007). "An integrated vendor–buyer inventory model with quality improvement and lead time reduction." International Journal of Production Economics 108(1): 349-358. Pan, J. C.-H. and Y.-C. Hsiao (2005). "Integrated inventory models with controllable lead time and backorder discount considerations." International Journal of Production Economics 93: 387-397. Rhee, B.V.D., Schmidt, G., Veen, J.A.A.V.D., Venugopal, V., (2014). “Revenue-sharing contracts across an extended supply chain” Business Horizons, 57(4):473-482. Sarkar, B., B. Mandal and S. Sarkar (2015). "Quality improvement and backorder price discount under controllable lead time in an inventory model." Journal of Manufacturing Systems 35: 26-36. Sethi, S. P., H. Yan and H. Zhang (2004). "Quantity Flexibility Contracts: Optimal Decisions with Information Updates." Decision Sciences 35(4): 691-712. Silver, E., D. F. Pyke and R. Peterson (1998). "Inventory management and production planning and scheduling." Wang, C., R. Huang and Q. Wei (2015). "Integrated pricing and lot-sizing decision in a two-echelon supply chain with a finite production rate." International Journal of Production Economics 161: 44-53. Wong, W.-K., J. Qi and S. Leung (2009). "Coordinating supply chains with sales rebate contracts and vendor-managed inventory." International Journal of Production Economics 120(1): 151-161. Yıldırmaz, C., S. Karabatı and S. Sayın (2009). "Pricing and lot-sizing decisions in a two-echelon system with transportation costs." OR spectrum 31(3): 629-650. You, P.-S. and Y.-C. Hsieh (2007). "An EOQ model with stock and price sensitive demand." Mathematical and Computer Modelling 45(7): 933-942. Zhao, Y., Choi, T.M., Cheng, T.C.E., Sethi, S.P., Wang, S., (2014). “Buyback contracts with price-dependent demands: Effects of demand uncertainty” European Journal of Operational Research, 239(3): 663-673. Zhu, S. X. (2015). "Integration of capacity, pricing, and lead-time decisions in a decentralized supply chain." International Journal of Production Economics 164: 14-23.